and is the intellectual property of the author. Cerridwen is one of the Old Ones, one of the great megalithic pre-Christian Goddesses of the Celtic World 1. Although, in her story, she embodies all three lunar aspects of the Goddess, Maiden, Mother and Crone 2 , she is primarily worshipped in her Crone aspect, by and through her Cauldron of Wisdom, Inspiration, Rebirth and Transformation 3 . The cauldron has an intimate association with femininity, together with the cave, the cup and the chalice, and the association of femininity with justice, wisdom and intelligence goes back to very ancient times 4 . Cerridwen was originally worshipped by the people of Wales. It is told that she lived on an island, in the middle of Lake Tegid, named after her husband, with her two children, a beautiful daughter, Creidwy, and a very ugly son, Afagdu. To compensate her son for his unfortunate appearance, Cerridwen brewed a magickal formula, known as "greal" 5 , which would make Afagdu the most brilliant and inspired of men. For a year and a day, she kept six herbs simmering in her magickal cauldron, known as "Amen" 6 , under the constant care of a boy named Gwion. One day, while Gwion was stirring the cauldron, a few drops of the bubbling liquid spattered on his hand. Unthinkingly, and in pain, Gwion, sucked his burned hand, and, suddenly, he could hear everything in the world, and understood all the secrets of the past and future. With his newly enchanted foresight, Gwion knew how angry Cerridwen would be when she found he had acquired the inspiration meant for her son. He ran away, but Cerridwen pursued him. Gwion changed into a hare, and Cerridwen chased him as a greyhound; he changed into a fish, and Cerridwen pursued him as an otter; he became a bird, and she flew after him as a hawk; finally, he changed into a grain of corn, and Cerridwen, triumphant, changed into a hen, and ate him. When Cerridwen resumed her human form, she conceived Gwion in her womb, and, nine months later, gave birth to an infant son, whom she, in disgust, threw into the water of a rushing stream. He was rescued by a Prince, and grew into the great Celtic bard, Taliesin 7 . Cerridwen's cauldron is an ancient feminine symbol of renewal, rebirth, transformation and inexhaustible plenty 8 . It is the primary female symbol of the pre-Christian world, and represents the womb of the Great Goddess from which all things are born and reborn again 9 . Like the Greek Goddess, Demeter, and the Egyptian Goddess, Isis, Cerridwen was the great Celtic Goddess of inspiration, intelligence and knowledge, and was invoked as a law-giver and sage dispenser of righteous wisdom, counsel and justice 10 . 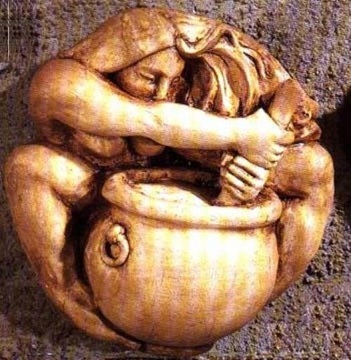 The image of her cauldron, holding the magickal potion of wisdom, is the mythical origin of the Halloween image of a cauldron-stirring hag, making up her witch's brew 11 . The brew had to simmer for a year and a day, a common passage of time in Celtic lore, and a standard time before magickal initiation. Today, many Druidic pagans believe that her shape-shifting chase after Gwion was meant to represent the different elevations of Druidic initiation rites 12 . The chase can also be seen as representative of the many changes our souls must make, into different forms, and over different human lifetimes, before we can discover the very reason for our existence 13 . The potent nature of her brew has, today, transformed Cerridwen, in some eyes, into a goddess of fertility, creativity, harvest, inspiration, knowledge and luck 14 . A festival in her honor is celebrated on July 3rd, and the pink sow, a symbol of fertility, good fortune and enrichment, is said to be her matron animal 15 . The story of Cerridwen is often interpreted as being fueled by anger, but it can also be seen as a metaphor for the relationship of teacher and student. Cerridwen was the teacher, and Gwion the student, and it is the job of a teacher to challenge the student, when the student is ready. The random drops of Cerridwen's special brew, which flew out of her cauldron, and onto Gwion, can be seen as sparks of knowledge, which, when they hit our being, run through us like wild fire, exploding with sudden meaning 16. During the chase, Cerridwen forced Gwion to acquire new wisdom, as she shapeshifted into the predator that could catch and kill the prey whose form Gwion had assumed. Cerridwen forced him to use the knowledge he acquired, as they ran, together, and, in the end, she devoured him, to bestow upon him a new and greater identity, that of the legendary poet, Taliesin. Thus was he initiated into the mysteries 17. Transformations of all kinds are an integral part of Celtic mythology, and the center of this mythical element is often a cauldron. In the Celtic Mystery Tradition, there are three types of cauldrons, the Cauldron of Transformation, the Cauldron of Rejuvenation and Rebirth, and the Cauldron of Inspiration, and Cerridwen's cauldron symbolizes the merging together of all three of these aspects into one archetypal cauldron 18 . The Celtic afterworld is called the Land of Youth, and the secret that opens its doors is found in Cerridwen's cauldron: the secret of immortality lies in seeing death as an integral part of the cycle of life, where every death brings rebirth, every ending a new beginning 19 . Gwion's sudden absorption of the three drops of brew from Cerridwen's cauldron also shows what appears, to humans, to be the random nature of greatness and inspiration. The three drops of Cerridwen's brew are an encryption of primal creative power. Gwion appeared to be a random recipient of the cauldron's bounty, yet, when he was reborn, he became the famous poet, Taliesin. The impact on Gwion was such that he literally had to be transformed, several times, and reborn, in human form, to assimilate the knowledge he had unwittingly gained 20. 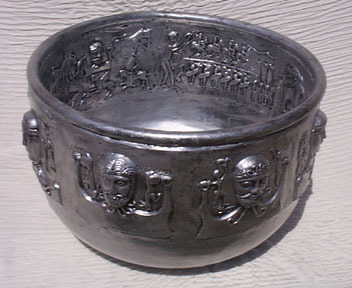 The ancient cauldron of the Goddess was reinvented, by patriarchy, as the Holy Grail of Arthurian legend 21 , and was transformed into a solar symbol, the Chalice used by Yeshua, or Jesus Christ, at the Last Supper 22 . Very little of its mystical meaning was changed, however, and it is still, today, a symbol of enlightenment and spiritual transformation 23 . 1. Farrar, Janet and Stewart, A Witches' Bible, Phoenix Publishing, Inc., Custer, WA. p. 79. 2. Grimassi, Raven, The Wiccan Mysteries, Llewellyn Publications, St. Paul, MN., p. 195. 3. Ibid., fn. 1, p.157. 4. Eisler, Riane, The Chalice and the Blade, Harper San Francisco, Harper Collins, New York, NY., p. 69. 5. Farrar, Janet and Stewart, The Witches' Goddess, Phoenix Publishing, Inc., Custer, WA., p. 209. 7. Monaghan, Patricia, The New Book of Goddesses and Heroines, Llewellyn Publications, St. Paul, MN., pp. 82-83. 8. Ibid., fn. 4, p. 265. 9. Ardinger, Barbara, Ph.D., Goddess Meditations, Llewellyn Publications, St. Paul, MN., p. 53. 10. Stone, Merlin, When God was a Woman, Harvest/HBJ, New York, NY., p. 4. 11. McCoy, Edain, Celtic Myth and Magick, Llewellyn Publications, St. Paul, MN., p. 191. 13. Matthews, Caitlin, The Celtic Spirit, Harper San Francisco, Harper Collins, N.Y., New York, p. 316. 14. Telesco, Patricia, 365 Goddess, Harper San Francisco, Harper Collins, N.Y., New York, July 3rd. 16. Matthews, Caitlin, The Celtic Spirit, Harper San Francisco, Harper Collins, N.Y., New York, p. 385. 17. McCoy, Edain, Celtic Women's Spirituality, Llewellyn Publications, St. Paul, MN., pp. 39-40. 18. Ibid., fn. 2, p. 195. 19. Starhawk, The Spiral Dance, Harper San Francisco, Harper Collins, N.Y., New York, pp. 97-98. 20. Matthews, Caitlin, The Celtic Spirit, Harper San Francisco, Harper Collins, New York, NY., pp. 148, 375, 385. 21. Starhawk, The Spiral Dance, Harper San Francisco, Harper Collins, New York, NY., pp. 97-98.